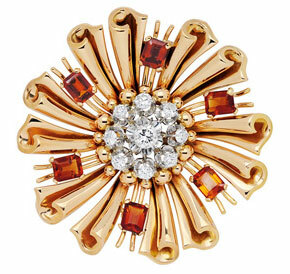 Retro 18-karat pink gold sunburst brooch. Whether you’re located in a small community or a large metropolis, your regular base of customers probably consists of a mix of professionals, all in varying states of prominence. No matter how long you’ve been in the business, and how much experience you’ve had, if you learn to expect the unexpected and capitalize on new connections, the little surprise that’s waiting just around the corner can be used to your advantage. With a tweet here and a text there, every new technical device eases the manner in which you make these potentially profitable alliances, and the bonus is the world becomes a smaller, more connected place. It‚Äôs simple to merge the effectiveness of technology with a genuine, old-fashioned smile. After all, it‚Äôs been estimated the average person knows 250 people, so by applying the idea of six degrees of separation, your possible future sales certainly expand. Ever notice how some professions seem recession-proof in terms of spending habits and discretionary income? Customers who are ensconced in the upper echelons of the financial world – bankers, hedge fund managers, and legal eagles, for example – may decide to spend some of their salary or bonus at your place of business. Perhaps they‚Äôve had their eye on a vintage wristwatch that reminds them of their flying ace maternal grandfather or a bauble for a significant other. Even during the most trying of times, a percentage of funds generated from golden handshakes, buyouts, and severance packages can be spent on jewellery. If the prevailing spirit of the general populace is somewhat gloomy, many of your potential customers could well be insulated from negative economic fallout or meltdowns. From the ‚Äònever judge a book by its cover‚Äô rule of business acumen… Have ever had one of those potentially embarrassing moments when your first instinct is to ignore, albeit politely, your mail carrier‚Äôs mother? A plainly dressed and nondescript woman of a certain age, she enters your premises hoping you‚Äôll buy a piece of jewellery that‚Äôs been in her family forever. Placing a wrinkled plastic baggie in front of her, she unwraps a folded piece of paper towel, and lo and behold, proffers a most exquisite gold necklace. Or maybe your next door neighbor uses an old piece of ‚Äòreplica costume‚Äô jewellery to step in for a missing button on her cardigan that she shyly hopes you might find interesting. Turns out, it‚Äôs vintage, encrusted with diamonds and made from platinum. Serendipity is a welcome addition to your bottom line. 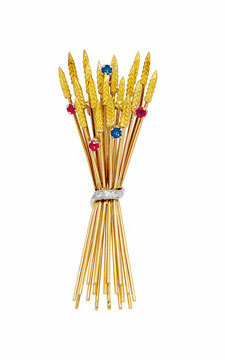 Wheat sheaf brooch in 18-karat gold, accented with gemstones and diamonds. 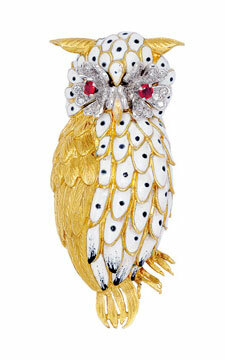 Enamel and 18-karat gold owl brooch. And with the theory there’s often some truth to the stereotype, consider the sublime appropriateness of the funeral director that collects memento mori and mourning jewellery, along with miniature hand-painted portraits of long-departed and non-related ancestors. Or your local farmer and free-range egg provider who starts amassing a collection of brooches with wheat sheaf, animalia, and feather motifs. Yet, it’s not just what they can do for you, but what you can do for them. You may just have a pair of ziggurat-shaped diamond earrings that remind the architect next door to you of the exterior of her signature building design. Consider the old song about the finger bone connected to the hand bone that’s connected to the wrist bone, or the Mother Goose nursery rhyme, the one about the house that Jack built, minus the malt, the rat, and the cat – just substitute diamonds, platinum, and pearls. The realtor who buys cufflinks from you knows the builder who collects pocket watches and plays golf with the head of the planning commission who loves pink gold and whose daughter baby-sits the retro-addicted chief of pediatrics at the children’s hospital who’s married to a diamond ear stud-wearing crown counsel. You get the picture. An exchange of business cards can occur anywhere – a Rotary meeting, the hair salon, the golf course, or even during pleasant elevator conversation commiserating about the weather. With your sound instincts, you can strengthen all these collaborative connections to encourage the buying habits of incurable or novice collectors. Every chance encounter offers another subtle opportunity to promote your services, expertise, and experience naturally and casually. Your future hinges on this potential.